Nytro winning a Group 4th under judge George Taylor. Awards: high in class Novice A (1995), The Boxer Club of Canada Royal Trophy (1995). 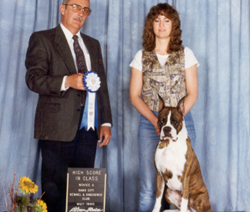 Titles: Canadian championship, Companion dog obedience designation. About Nytro . 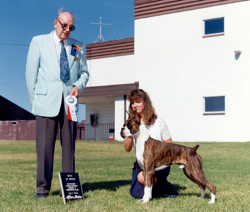 . .
Nytro was our first homebred champion to earn a CD title. He was loved by Doris, Dennis, and Dayna Avery of Moose Jaw, Saskatchewan. Nytro was known to wear a black leather jacket and was so named because of his explosive personality. Nytro’s show career . . .
Nytro was always shown by his owner, Doris. His first introduction to showing was at a sanction match where he placed second to his brother, Cajan. 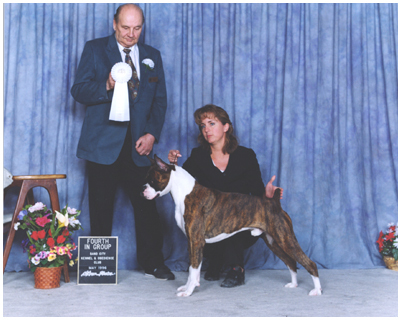 Nytro earned a Boxer Club of Canada award for obtaining his championship and CD in the same year. In January 1995, Nytro obtained his Canadian championship. In May 1995, Nytro obtained his Companion Dog designation. In May 1996, Nytro won a Group 4th placement under judge George Taylor. Nytro at various stages in his life . . .
Nytro's championship under judge Pat Miller. 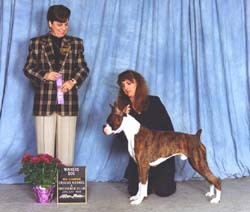 Nytro winning best of breed. Nytro's high in class under judge Jim McGarry.